Need new apps for your favorite device? Here are 42 iPhone, iPad and iPod touch apps that just hit the App Store. 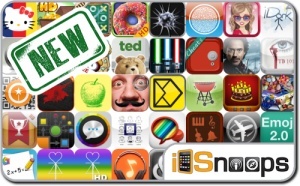 This new apps alert includes Simple Racing, Fabled Lands, iDork 2, QRcode Magic, Blind Tennis, Infect The World, Donuts HD-Cooking games, Tic Tac Toe, Pirates, Color Texting, Visuic, ByPost Postcard Maker, and many others. For real-time app info, check out our Real-Time Deals section, as well as our App Charts and Top 5 Matrix.